Mary Redmond's speech for St. Francis Hospice, July 1993, with handwritten note to her Mother. Written version of a Mary Redmond's speech for St. Francis Hospice, July 1993. Includes a handwritten note to her mother. 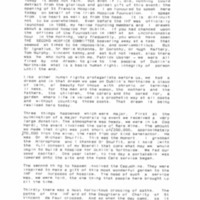 A typed document, with a handwritten note in the right-hand corner. Dr. Mary Redmond., “Mary Redmond's speech for St. Francis Hospice, July 1993, with handwritten note to her Mother. ,” Archives Hospice Foundation, accessed April 22, 2019, http://archives.hospicefoundation.ie/document/20.